While both are fifth-year-senior tight ends, Jacob Pedersen (left) is more of a receiver, with 36 catches for 501 yards this season, while Brian Wozniak is more of a blocker -- though he has four touchdowns in 2013. MADISON, Wis. — The first day Jacob Pedersen spent on Wisconsin’s campus in the summer of 2009, future teammate Brian Wozniak walked past him without the slightest hint of who he was. But Pedersen, a lightly recruited tight end from Menominee, Mich., knew plenty about his competition. "I knew who he was," Pedersen said. "I knew he was the more heavily recruited kid and I just came in trying to outwork him. That’s what I had done my whole life. Me and him were always going head-to-head in practice, no matter what it was, if it was 1-on-1 drills or anything else." You might think such tough competition would lead to resentment and bitterness among the two when one surpassed the other for playing time. 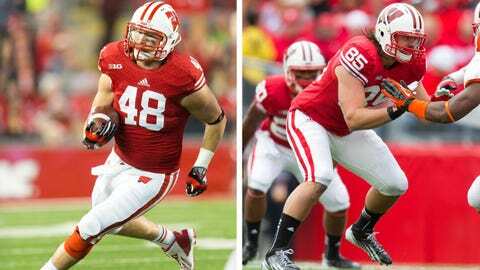 Instead, they have developed a friendship over the years and will now go out together as fifth-year seniors in their final game when Wisconsin plays South Carolina in the Capital One Bowl. "We’ve been roommates at the hotel since freshman year," Wozniak said. "Sometimes we have very different personalities. He’s a big outdoors guy. So it’s kind of fun being around that, kind of fun watching him watch hunting shows the nights before games. I can’t complain. He’s been a heck of a competitor, so it’s been fun." Though Pedersen has earned more accolades during his career, he and Wozniak both have become vital components to the offense. This season, Pedersen caught 36 passes, which ranked third on the team, for 501 yards and three touchdowns. Pedersen, who earned Big Ten Tight End of the Year last season, garnered honorable mention status even though his total catches and yards increased. Wozniak, meanwhile, has spent much of his time as a blocker. He caught five passes this season, but four of them went for touchdowns. During a 31-24 Senior Day loss against Penn State, Wozniak caught a career-high two touchdowns in one game. "Writing down some of the goals this year, I wish I would have had about 15 more catches," Wozniak said. "That was setting the bar high. Other than that, I can’t really complain. I’ve had my fair shots at great defenses. Went against a lot of great defensive ends. Played on a lot of great teams here, so I can’t complain too much. But as a competitor, you always want more." Wozniak acknowledged that it was tough at times to watch Pedersen while he stood on the sideline early in his career. Though he was happy for his teammate, the competitor inside of him wished it were him. Still, Wozniak did not allow any ill will to creep in, and he, too, earned plenty of playing time. Wozniak has appeared in 43 games with 18 starts, while Pedersen has played in 52 games with 32 starts. "It all worked itself out," Wozniak said. "The big thing with playing, the more work you put into it, the more chance you have to play. That’s what ended up happening for me. That’s how Ped got all his playing time. He put the work in." Part of Pedersen and Wozniak’s success stems from their willingness to embrace team concepts. Playing in an offense that focuses heavily on the running game has meant their opportunities to catch passes have been limited. But they also have been relied on in key moments, particularly in the red zone. The duo has accounted for seven of the team’s 20 total touchdown catches this season. All four of Wozniak’s touchdowns have come from within six yards, and two of Pedersen’s three scores have come from within two yards. Both players say they will be looking to contribute any way they can in order to go out a winner on Jan. 1. "The most important thing is for us to keep winning games and keep playing well," Pedersen said. "Obviously, the catches and yards and touchdowns and all that kind of stuff is nice, but when it comes down to it, I’m a team guy through and through and so is Brian. Brian obviously could have been very frustrated. It was a great Senior Day for him to get the two touchdowns. "Neither of us really batted an eye most of the time. Everything we did was what we felt was good for our team." Borland honored: Wisconsin linebacker Chris Borland was named first-team All-America by the Football Writers Association of America this week, joining Alabama’s C.J. Mosley and Buffalo’s Khalil Mack at linebacker. Borland became the first Wisconsin defensive player to earn first-team All-America honors since defensive end Erasmus James in 2004. The Badgers have had at least one first-team All-American in 15 of the past 16 seasons, including nine total selections in the past four seasons. In addition to his first-team honor from the FWAA, Borland earned second-team All-America honors from the Associated Press, Athlon, CBS Sports and Sports Illustrated. Senior left guard Ryan Groy was named third-team All-America by the AP, and sophomore running back Melvin Gordon earned honorable mention on Sports Illustrated’s All-America team. Borland finished the regular season ranked third in the Big Ten at 9.3 tacklers per game. His 102 total tackles were 40 more than any other Badgers player. This season, he matched the Big Ten record with the 14th forced fumble of his career and ranks second in UW history with eight fumble recoveries. Borland already earned consensus first-team All-Big Ten honors and was named both the Butkus-Fitzgerald Linebacker of the Year and the Nagurski-Woodson Big Ten Defensive Player of the Year.